Been a while since we had a Great Moment in Cycling but here's a keeper. Copenhagener in the middle of a frightfully elegant and graceful dismount, bathed in the spring sunshine. Keeping a keen eye on the shop window that attracted her attention. She's gorgeous with that outfit. But maybe her poise will be destructed from pulling that bike alone. 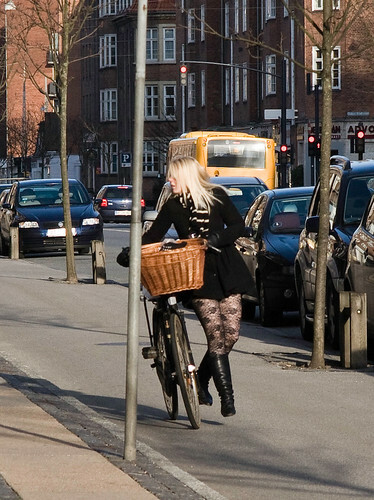 The perfect cycle chic floating moment in time.... and the right bike, outfit, tights and boots! My new aspiration is to be her. If only you were able to Photoshop that pole out of the foreground! But maybe that would detract from the spontaneity of the moment. Another CCClassics calendar moment, to be sure! Pure graceful second nature… I bet she has done that dismount from a bike, more than a thousand times. If she was asked to explain how she does it, I would bet she couldn’t do it. She just does it naturally. Oh this is gorgeous! Wonder what she bought in the shop? Great capture. @Kiwehtin: no that post is essential to the story: that is where she will park (and lock) her bike against !